WASHINGTON, D.C. (Oct. 26, 2015) — U.S. Sen. Claire McCaskill today responded to a conference call Valeant held with its investors, as well as to a recent letter the company sent her after she had demanded answers regarding Valeant’s dramatic increase in the price of some of its medications. Valeant failed to provide a complete response to McCaskill’s questions. McCaskill also responded to a recent letter Valeant provided to her office, which she described as “deeply disappointing.” A copy of McCaskill’s response to Valeant is available online HERE. In a Senate hearing in July, McCaskill questioned former Valeant CFO Howard Schiller regarding Valeant’s February 2015 move to increase the price per vial of Isuprel, a medication used to treat cardiac arrest, from $215 to $1,346. That same month, Valeant also increased the price per vial of the drug Nitropress from $257.80 to $805.61. 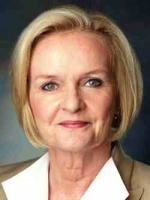 Visit mccaskill.senate.gov/accountability to learn more about McCaskill’s fight for stronger accountability in Washington.